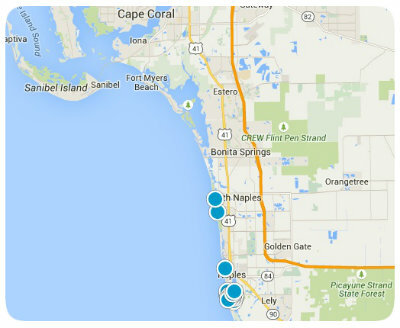 In the world renowned Naples Florida you will find the luxurious gated community of Bent Creek Preserve. This amazing new home community boasts 5 designs of single family homes from the Floresta Collection. Available living spaces range from 2,000 to over 4,400 square feet, and with controlled access entry, residents enjoy both security and privacy. Floorplans can be one or two-story, have 3 to 5 bedrooms, 2 to 4 baths and 2 car garages. This community also boasts amenities such as a central recreation center, panoramic water views, tennis courts, an aqua sport area and an impressive fitness center. The 7,500 square foot clubhouse has a resort-style pool where you can relax after a hard day’s work. The gorgeous community lakes and lush landscaping throughout the area will set the tone for your new resort lifestyle. With easy access to I-75, residents can enjoy all that North Naples has to offer, including upscale shopping, casual and fine dining, as well as a number of exciting entertainment options. On the south side of Immokalee Road, opposite The Quarry, Centerline homes has masterfully constructed this remarkable community. With all of its exquisite amenities and a hard-to-beat location in the prestigious community of Naples, home buyers should carefully consider Bent Creek Preserve when in the market for Florida real estate. If you would like to buy a home in the opulent Bent Creek Preserve, or you have other real estate questions, please do not hesitate to contact us today for more information.